I began my quest to discover Yiddish art in London on a sunny Wednesday afternoon. I had tracked down a Jewish art gallery on the Internet and I was fully convinced that it would be reasonably easy to discover an artist with Yiddish speaking origins somewhere within one of the gallery’s frames. So I set off to the Ben Uri art gallery, situated in the heart of St Johns Wood, home also to the Beatles’ much-crossed Abbey Road and to the Saatchi Gallery. I got off the train at Kilburn High Road in high spirits, ready to dig up some intriguing facts and delve into a London-style aspect of Yiddish culture… However, I fell at the first hurdle. Stepping out of the station onto a high street that I had never set eyes on before on what felt like London’s warmest day of the year yet, with no map and only a thimble-full of water left, made for a not-so-successful start to my treasure hunt. In other words, I didn’t have a clue where I was. Two baffled looking mums and a builder later, I was no closer to finding the gallery – nobody seemed to have heard of it. Consequently, I headed into a maze of council housing estates combined with the odd row of mansions until I finally found Boundary Road, home to the Ben Uri art gallery. Nestled in a parade of shops, the gallery was slightly smaller than I had anticipated. On entering, I was faced immediately with the gallery’s current exhibition, entitled No Set Rules. The exhibition explores the ‘limitless possibilities of working on paper’, using artwork from Jewish artists working in Britain from the last century. The gallery is vital in keeping alive and promoting Jewish heritage in London, and it endeavours to become known as ‘The Art Museum for Everyone’ in order to include people from all backgrounds and beliefs in their celebration of Jewish culture, perhaps making it an organisation that truly adheres to the principals of global citizenship. The Ben Uri gallery first emerged in London in 1915 (meaning that this year is its 100th birthday) against the backdrop of a flourishing East End Jewish Community, making it the first Jewish cultural organisation to be set up in Britain. Since, the gallery’s collection has grown significantly, and the foundation now boasts a staggering 1300 works, all of which are by artists of Jewish descent. 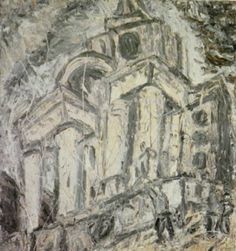 Well-known names feature amongst the collection, such as Frank Auerbach, Marc Chagall and David Bomberg, making it a widely admired and visited organisation. Furthermore, the organisation seeks to highlight the revolutionary effect of the migration of many Jews on British art, demonstrating how Jewish culture has become intertwined with with great art movements in England and in doing so has produced some astounding results. 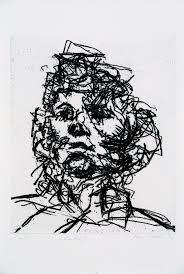 Amongst the 49 works exhibited are works by Frank Auerbach, born in Germany to Jewish parents who fled to Britain to escape Narzism, David Hockney and Leon Kossoff, all of which have embellished the evolution of British art against the backdrop of their Jewish origins. However, in the art gallery itself and in further research, there doesn’t appear to be much mention of the Yiddish language in association with these artists. On asking the receptionist at the museum I was left none the wiser; Yiddish still hadn’t made an appearance. Therefore, even if some of these Jewish painters do or did speak Yiddish, this particular linguistic ability doesn’t seem to be made clear. Why is this? Being able to speak Yiddish seems to be a fact that many people don’t consider to be interesting enough to declare, something unworthy of mention. We need to change this. We need to spread the word that the Yiddish language, and the culture that lies beneath it, are worthy of mention. Yiddish is a language in its own right that has died down because of decades of oppression. It’s revival is essential in order to honour the memory of the many Yiddish speakers whose voices were devalued and ignored, in order to demonstrate that they should have had the freedom of speech that they deserved and to declare that we stand up for the right to choose one’s own lifestyle. And then maybe the millions of victims of anti-semitism who had their voices so cruelly stolen from them will somehow have a voice today. Perhaps they can live on through our efforts to keep Yiddish alive.